Shukhbashpur Dighi (সুখবাসপুর দিঘী), nearly hundred years old Lake situated at Hatimara, Rampal Union Parishad of Munshiganj Sadar. Almost all around the year it is filled with water. 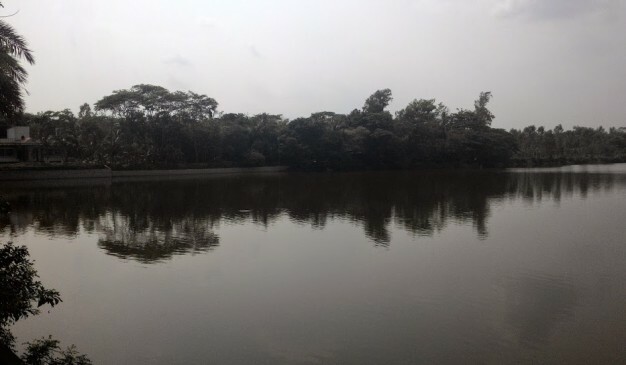 It is a rectangular shaped lake which is surrounded by different types of green trees. Its natural beauty, gentle breeze, calm and quiet environment attracts people to spend their leisure time at the edge of this dighi. Above all, its oldness and different types of myth also make people visit this place. From Muktarpur Bus stop of Munshiganj Sadar, you can ride on a Bus moving towards Tongi Bari Upazila.This Dighi is just 15 minutes away from Muktarpur. There are several transport is available from Dhaka to Munshiganj. The bus services are “Nayan Paribahan”, “Dighir par Paribahan” and “Dhaka Transport”, all of the buses used to start from “Gulistan” of Dhaka. It will cost you 60-80 taka, and will require 1 hrs to 2 hrs bus journey depending upon the road traffic. Also you can hire CNG auto rickshaw from the “Postogola”, and it will take you 250-350 to take you at Muktarpur bridge. Remember, if you are hiring CNG, make sure who will provide the toll of the bridge. For you information, the toll fee is 20 taka. So negotiate with the driver of CNG about who will provide the toll. Though the district is just beside the Dhaka, still its hard to find a suitable hotel from the district. The main reason, may be people from dhaka used to come this place for a single day trip. But anyway, if you need to stay at Munshiganj town, that case I’ll suggest you to stay at “Hotel Comfort” this one is the best from the town. Also you there is another one which is “Hotel three star international”. But the quality of the rooms of this hotel is not that much good. For both cases, it will take 100-700 taka per night depending upon the room. Referred where to eat at Munshiganj. Click here. You may also find a place to eat at Tongibari Upazila. Pocha Dighi and Ghora Dighi have own historical and religious significance toward the villagers. The crocodiles in the pond never will harm you even if you touch them. Here many people used to come every day in a way to make their wish fulfilled. As a result many gifts were given by them. The belief of them is high with that. So many wish have already been fulfilled. There used be a fair in almost every day. Different types of local items can be found here to shop. Baikka Beel Sanctuary is to protect and restore aquatic biodiversity (particularly fish and birds) in Hail Haor. A secondary aim is through the visitor facilities to enhance enjoyment of the site and understanding of nature, the value of wetlands and need for their conservation. The sanctuary and its facilities are a model that can encourage replication of similar sanctuaries elsewhere in the country. 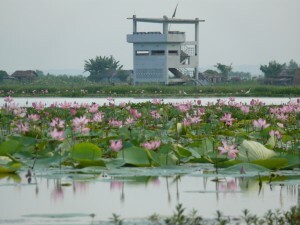 Baikka Beel is a 100 ha wetland sanctuary located in Hail Haor a large wetland seasonally extending from 3,000-12,000 ha in north-east Bangladesh. Baikka Beel comprises of open water with emergent vegetation (mostly lotus), and a fringe of native swamp forest planted in 5-8 years ago. Originally it was protected to conserve and restore fish and it supports about 90 species of fish, but populations of wintering water birds rapidly increased. So far 141 bird species have been recorded in the sanctuary. Up to 9 Pallas’s Fish Eagles winter, Large flocks of ducks including up to 4,500 Fulvous Whistling-duck occur in winter, Great Spotted Eagle is regular, and good numbers and diversity of shorebirds, marshland warblers and other birds occur. Mammals are few but include Fishing Cat. A visitor tower with several permanent interpretive displays was opened in early 2007. This is the only such facility in the country and this is the only substantial community managed wetland sanctuary in the country. It is planned to construct a visitor centre and other facilities in 2010 with funds left over from the earlier MACH project. Visitor number have not been recorded as reliably as would be ideal, but are in the low thousands per year and include student groups, diverse government officials, and a wide range of foreign visitors. 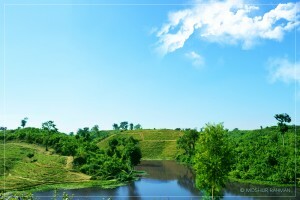 Sorobor (সরোবর) is one of the most beautiful tourist spots in Gobindaganj under Gaibandha district. It is a natural lake. The main advantage is that Sorobor is located besides the historical place of Bardhan Kuthi (বর্ধন কুঠি). The lake is surrounded by lovely green trees. In everyday, many people come here to enjoy its natural beauty and pass sometime around this lake with family and friends. In the summer season, this place becomes busier with more crowd comparing to other seasons. 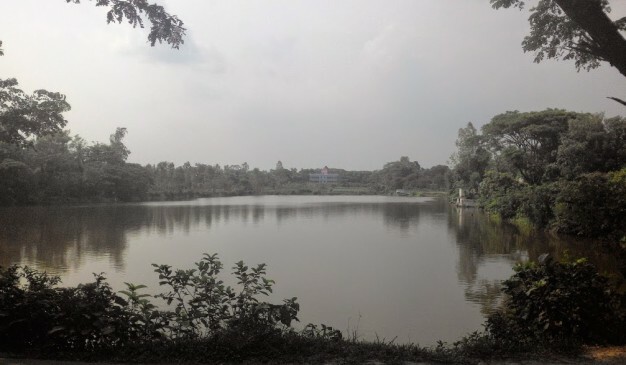 Madhobpur Lake and Tea Estate is located in Kamalganj Upazila of Moulvibazar District. 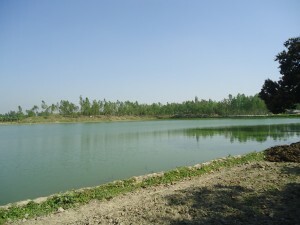 The pleasant natural Madhobpur Lake is surrounded by small hills (Tila). Most of the hills are planted with tea trees. 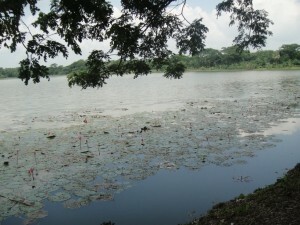 The bank side of the lake is full of lotuses and lilies. The color of the lilies is bluish which adorns this place with a bluish sphere. The lake is surrounded by small hills. The lake is so wide and it’s hard to cover the whole lake with your camera. There is always heavy wind blows surround the lake that made the water of the lake looks like a river or calm sea water. You might have seen such kind of magenta and white colored lilies before. It is so beautiful, and the lily looks like a bit glowing from far. It seems that someone Photoshoped the flowers for that glowings.